On a Tuesday morning, mid-January, I was concerned about the weather for the drive from Lyon to Paray-le-Monial, which goes through hills at a higher altitude further from the city than the previous day's drive to Ars-sur-Forman. Three different weather reports agreed it would rain. One of them warned that fog was likely and mentioned a "minimal" chance of heavy snow. What none of them mentioned was a chance of a beautiful, sunny day. The air was cool and crisp, but not terribly cold, and the drive was scenic and otherwise uneventful. I didn't see clouds begin to gather until on my way back to Lyon late that afternoon. Along the way, I passed the turnoff to Cluny, where the original monastery once was for the Cluniac reform in the Benedictine Order. However, that monastery has been rebuilt over the years, unlike the church from the Cluniac monastery at Paray-le-Monial, which still stands nearly a millineum after it was built. Only the church remains from the original monastery, and it is massive. The monastery was built in the 10th or 11th century, and the church was built in the 12th century, around the same time when the Cistercian St. Bernard wrote his book quoted above. 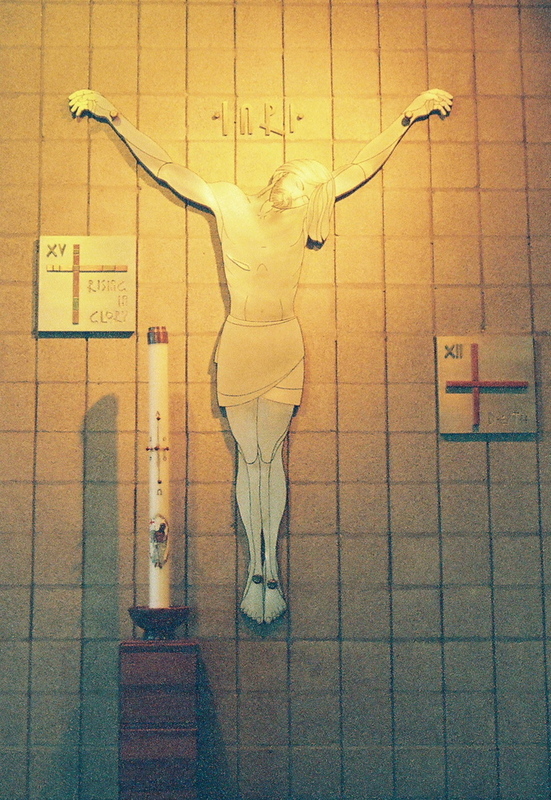 The large church, built on the initiative of abbot St. Hugh of Cluny, is now called the Basilica of the Sacred Heart, and it is part of a Catholic retreat center operated by the Emmanuel Community. The Catholic Encyclopedia says of Paray-le-Monial that "The Cluny monks were, 999-1789, lords of the town." In 1678, the Visitandine nuns arrived in the town. In the nearby Chapel of the Visitation, part of the Visitandine Monastery, St. Marguerite Marie Alacoque lived in the late 17th century. She spoke to Jesus who frequently appeared to her as her Director, and who confided to her the mission to establish the devotion to His Sacred Heart. Since 1873, Paray-le-Monial has drawn increasing numbers of pilgrims each year, now numbering around 400,000, largely made up of people with a devotion to the Sacred Heart. On the day when I was there in January, there were only a few. I thought about St. Bernard's words while I was there. I had a strong sense there of the presence of the Holy Spirit, and thought about the lives of the monks, unknown, their names not remembered, who lived their lives there over the centuries, chanting the hours in that place where the slightest sound resonates so loudly that they would have to have kept very still in times of prayer to maintain silence. The basilica is also known for its "mystical light", created by architectural design. There must have been unknown saints there through the centuries, the kind remembered on the Feast of All Saints. What they did that affects us today is what they accomplished by their lives of prayer and not action, and what they accomplished in building and maintaining the basilica over the centuries, probably maintenance done in boring manual labor while in meditation. I looked all around the inside of the basilica and then sat down in a chapel with the reserved host. The crisp air smelled and felt so good that I breathed it in deeply a number of times, clean and crisp, like the cool sunny day, and somehow quietly healing. After a while, I walked through the basilica again and took pictures. There were only a few other people around, so that there was a lot of solitude there, and it was very quiet. From there, I walked over to the Chapel of the Visitation. A young couple were there for a while, looking at the place where St. Marguerite Marie Alacoque's body rests in the chapel. Later, a nun came in alone and sat down a few rows behind me. I don't know from which order. The Visitandine nuns who live there came into their choir near the chapel, where we could see them, and chanted the office mid-afternoon. I left around 3:00 p.m. and went and walked through the garden by the basilica before heading back to my car. I looked around for somewhere to have lunch but found nothing open that late in the afternoon, so I headed back to Lyon to return my rental car. 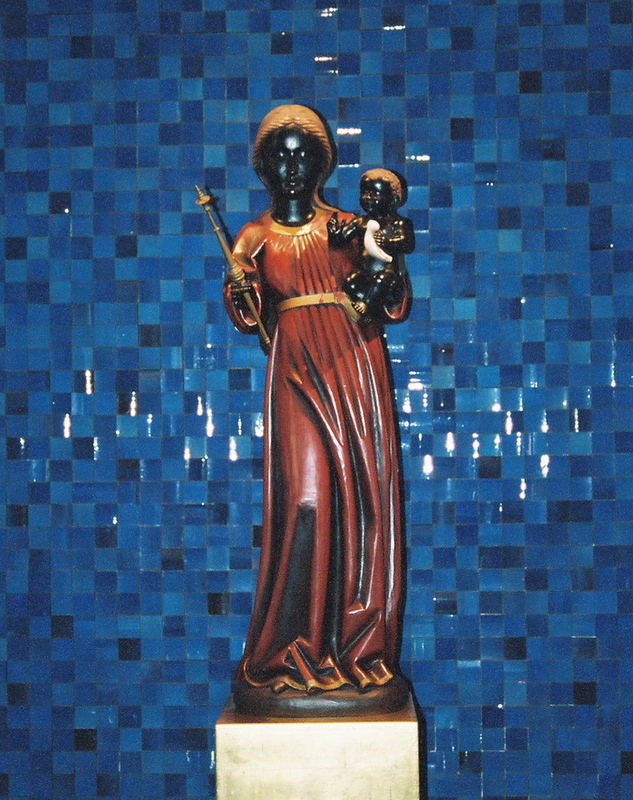 Picture: Statue of St. Marguerite Marie Alacoque in the Basilica of the Sacred Heart, Paray-le-Monial. A Day in Ars: A "Meeting Place for the Humble"
I devoted a day to Ars during my January trip to France. I did not blog much about it at the time, and I thought I would post now what I wrote back then for a few friends, with the attention on Ars at the beginning of the Year of Priests. I say that I devoted a day to it, and not that I spent a day there, because a winter rain storm led to traffic problems that complicated the drive, since I was unfamiliar with the roads. The confusion of the morning ultimately added meaning to the day, and a little bit of humor. "Man is a beggar who needs to ask God for everything. . . A pure soul can ask everything from God, even miracles, and he will refuse him nothing." On a rainy Monday morning in January, the second full day of my trip, I went to pick up a rental car at 9:00 a.m., hoping to drive the 25 miles or so to Ars easily in time for the 11:00 a.m. Mass. It was not to be. There was a pouring rain. The car rental agency gave me directions to Route A-6 from Lyon to Ars, but the directions they gave me involved driving through a tunnel that was closed that morning. My rental car was a stick shift. I hadn't driven a stick shift for a year, and Lyon is hilly. My first time up the road toward the tunnel, I was in the left lane and needed to be in the right. So up the hill I went, figuring I may as well practice for a while before getting on the freeway anyway. Back down the hill, second try, same mistake. Back down the hill, third try, right lane, but the tunnel was closed. Instead of Route A-6, I was on Route A-4, and a sign said it went to Paris. The guy at the rental car had told me to take that road to the entrance to A-6, so I was left wondering if the tunnel is always closed and if there was another entrance to A-6 further up the road. After driving for a while, I stopped and looked at my map, which didn't even have a road marked Route A-4. And by then it was 11:00 a.m., so I was going to miss Mass. Back down the hill, I went to the cathedral, where I knew I could stop and study the map for a while, and where I could find a restroom nearby. I found another entrance to A-6 a couple of miles away and finally was on the right freeway after almost giving up and taking the car back. While I was lost, I finally prayed something asking the Curé d'Ars to help me find the road to Ars. And then, frustrated and feeling hopeless, I prayed something like, "Holy St. Jean Vianney, I am a poor stupid woman who cannot find the road. Pray for me." The whole time, I was thinking about how slow my eyes were to see the signs, so that my reaction time was too slow to catch an unexpected turn, and how little sense I could make of the map. Beyond all, I had rented the car that day to avoid a 7 km taxi ride from the nearest train station which, by 11:00 a.m, sounded like it would have been no inconvenience at all! And that is despite the fact that driving in that part of France is no more difficult than driving in San Diego County, where I live. Then I sensed a response from St. Jean Vianney, "No one finds their way here without asking for help." And I thought it must be true, in more ways than one. Why hadn't I prayed any sooner than that about a visit to such a holy place as Ars? Or stopped and asked for directions again when the rental car company's directions didn't work out? And then, as I flipped through pages of my trip notebook looking for the proper exit near Ars, I came upon an article I had copied about the Curé. "Ars: A Meeting for the Prayer of the Humble" it was titled. I laughed. It had taken 3 hours of trial and error, but I thought I finally had enough humility to last me the rest of the day! I finally arrived at the church in Ars 3-1/2 hours after I picked up the rental car. It had taken me that long for a simple 25 mile drive! There is a monument to "the Meeting" in Ars, a statue that commemorates a meeting between St. Jean Vianney and a small shepherd boy when the saint was on his way to Ars for the first time to become its parish priest. He told the boy, "You have shown me the way to Ars, I will show you the way to heaven". So it seemed fitting that I could not find the way to Ars without praying for help. I spent the first 45 minutes praying in the new part of the church, which is very pretty in blue, pink and yellow French colors. Then I went through the Curé's house, looking and taking pictures. That house must have been very cold on rainy winter days in the early 19th century. It was cold and damp Inside even now. I looked at the simple table, the fireplace where the cooking and heating was done, and the roof that did not instill confidence even now, after the house has had the benefit of some restoration. It was a simple country parish's rectory, which he sometimes shared. There was one simply furnished room where he lived part of his time there, and another simply furnished room where he died, always in real poverty. Walking from there to the votive room, it occurred to me that this is where Jesus lived, the theme from Sunday's Gospel. Jesus would have lived in similar humility and poverty. Then I went to the Chapel of the Sacred Heart where the relic of St. Jean Vianney's heart is kept. The advantage to going in winter is that there are so few people around, so real silence is possible, real solitude is possible, even in places that attract a lot of pilgrims. This is a jubilee year, 150 years from the death of St. Jean Vianney, so it was especially unusual to find time there in solitude. Then I bought a book and a video and looked around, and went back to the Church and sat to pray for a while in the old part of the Church (the Basilica) in a Marian chapel off to the side, thankful to be there. Finally, as a light rain continued to fall, I found the road to the Carmel of Holy Curé d'Ars, and took a few pictures of its exterior before my phone/camera alerted that the battery was low. The gate from the road to the chapel was open, and the door was unlocked, so I gathered that pilgrims were welcome in the chapel, but the room was dark. I looked at the chapel but did not turn on the lights. The Carmel of the Holy Curé d'Ars is one of several Carmelite monasteries in France that are not affiliated with an order because they are more traditional than the orders are in France. They are still recognized by the Church as Carmelite, and they are mentioned on the website of Carmel in France. The nuns allowed someone to come in and videotape their way of life last year – a video that can be found on YouTube. I walked back to my car in the rain and left, probably around 4:00 p.m., having actually accomplished everything I had wanted to do that day despite the rain, and thankful that the storm never got any worse. The article I took with me mentioned the religious climate there, as the sanctuary of the Curé d'Ars draws priests and religious pilgrims from all over the world, like a little Rome. Elsewhere, I have read that people do sometimes sense St. Jean Vianney's presence there. The priest who is assigned there now has said that he has sensed the saint present with him during the Eucharist. I suppose that the shrine may be crowded during the warmer months of the year, especially during this jubilee year with the added attention drawn to Ars by the Year of Priests. It was quiet the day I was there. That is one of the reasons why I sometimes like to travel alone to places like that in winter. Picture: St. Jean Vianney's bedroom in the curé's house in Ars. That was true in August 2001. It was true in November 2006 when we received the diagnosis of pancreatic cancer and is still true in May 2008. John and I stand amazed as we watch everything our Heavenly Father works out in our lives, opening doors of witness in suffering and grief, yes, we grieve. All this gives us the opportunity to offer back to God our praise and thanksgiving for His faithfulness and goodness to us. This past Friday, Abbot Joseph of the Ukrainian Catholic Monastery on Mt. Tabor, wrote a post entitled On Buildings and Souls in his blog Word Incarnate. In it, he reflects back on the history of his monastery and its 26 year old church building, and uses the building as a metaphor for describing souls. As I read, I thought about the ongoing construction at the Benedictine abbey where I spent the week-end. Some construction is in process there, as some of their buildings are at an age such that they need it. The smaller, older chapel is being renovated too extensively for it to be accessible right now. Only the newer abbey church was available. When I sat in my room to read during the day on Friday, I heard the construction work on the nearby small chapel. But mostly, Abbot Joseph wrote about the changes we need to make in ourselves if we are to continue to survive, as well as the beautification we can then add by adding virtues. He spoke of the storms that the monastery church has weathered, and yet is still standing, but it might not still be standing if the needed changes had not been made. He offered a bit of teaching for readers to reflect on which aspects of their own spiritual lives could use a bit of repair and maintenance, and then perhaps some beautification by adding in the virtues. His post appealed to me partly because of the similarity with St. Teresa of Avila's use of a castle or mansion as a way of depicting someone's prayer life, but also because, even before I knew much about St. Teresa, I often saw my own life as symbolized by a house. I sometimes have dreams about such houses. The dreams go all the way back to my childhood, and the houses in the dreams have changed a lot over the years. Around the time when my parents were divorcing, when I was still a small child, a house a bit like my grandmother's house was burning down in the dream, and I was not able to get my family out of the fire. In later dreams, the house in my dreams was usually very modern. I found doors I never noticed before, and I went through them to find new rooms to explore that I had not noticed before, especially while I was in law school and developing a new career life. When life has seemed unpredictable and out of control, the dreams had elevators that went up, down, or even sideways without warning regardless of which buttons were pushed. And when I have been hiding from something I did not want to face, it was usually looking in through a window and catching me by surprise. So for me to think of my spiritual life and my prayer life as a house comes very naturally. The important thing, I would say, is to have a good foundation underlying one's faith: a personal knowledge and love for God, a relationship with God that can carry you through the dark times. There was a time, some years ago, when events in the church I then attended took me by surprise and propelled me into a painful time of rethinking what I believed. It then seemed to me that much of what I had built on the foundation of my faith had been based on things I had simply memorized and accepted over the years, which I was no longer sure were true, and all of that uncertain part of the structure began to collapse. Later, someone speaking of what I had once said about that struggle said that I had lost my faith, but that was not actually true -- I just found myself in a situation where I had to rethink what exactly I believed about God and Christ and Christianity. Having moved from a childhood in a Southern Baptist family to the Catholic Church in about 40 years, I have had some shifts that seemed easy, obvious and joyful, and others during that time that were painful and required deep thinking and struggling. It was then that much of what had been built up in the past had to be torn down and rebuilt for the house to remain strong. While I rethought much of what I had learned in the past, it is also true that the time I spent learning, praying, and reflecting on my faith had built a strong enough foundation to carry me through the painful transitions. When circumstances of life have shaken the structure of faith built up over years with lessons learned from others, lessons learned from books, often made up as much from theory as from the essence of who God really is, then part of what was once thought to be true can be threatened by doubts; part of what was once accepted theory can collapse under closer inspection when it faces the storms of life. It is then that what is known of God's love can hold intact a weakened structure until the needed renovations can be thought through clearly and set in place. If the structure is built on mere people, it may fail, since people will necessarily fail us. Only if the foundation is God -- the house built on the rock -- will there be strength and stability, knowing that God will not fail us. Good teachers, good pastors, good priests, have all been of enormous value. But time spent in prayer and meditation on God Himself is all that can build an inner core that will provide stability when those people fail us, as people always do. The framing should be flexible and strong. In an earthquake, too rigid a structure will collapse because it cannot bend when the earth moves beneath it. A steel frame structure, for its very flexibility, will sway with the motion and allow the forces of the motion to be dispersed over the entire structure rather than concentrated on one vulnerable spot. In the 1906 great earthquake in San Francisco, no one died who was in a steel frame building. Flexibility is important too in our spiritual lives. The Church changes, and the people in it change. The world around us changes, and we have to learn new ways of presenting the truth of the Gospel to that world, of being "in the world and not of it", and of seeking to transform the world around us through Christ's love, and yet still holding to the truth. Our faith is ever new, ever fresh, ever flexible when we begin each day by seeking what God would have us do that day. Many of the prayers posted here, from different saints in different centuries, begin with that simple premise of greeting each day with joyful expectation and surrender to the will of God. In the twentieth century, St. Edith Stein described such prayer, as did the prayer of St. Thérèse of Lisieux. In the thirteenth century, the prayer of St. Richard of Chichester on his deathbed sounds so full of youthful expectation: "May I know you more clearly, love you more dearly, and follow you more nearly, day by day". That flexibility in responding to the will of God gives even an aging saint a youthful exuberance and flexibility. And then there is that practical, ever necessary, work of getting to know ourselves and, in connection with that, confession of our sins and listening to the insights of another person who can bring some light of objectivity or at least another person's perspective to bear on how we see ourselves, our virtues and our sins. If not for that, the building would become old and worn and, as described by Abbot Joseph, the termites and the other destructive elements would eventually take over. In the thirteenth century, Angela of Foligno wrote that in prayer, “you come to know who you are and who God is. From the fact that you know, you love. Loving, you desire to possess what you love. And this is the sign of true love: that the one who loves is transformed, not partially, but totally, into the Beloved.” (Instruction XXVIII of The Book of the Blessed Angela (Instructions). Thus, Angela saw that in prayer, we know Christ and ourselves more. Because we know Him more, we love Him more. In so doing, our own identities are transformed, and we become more like Him. In the end, the goal is not merely to become ever new and ever more modern, but rather to live in the timelessness of eternal truths and values, taking our primary focus off of what is merely the latest thing in our own time and place and seeing, more clearly, God who is eternal and His truths that are eternal. Yet to do that, we have to also keep a steady perspective of ourselves who are in time and who are fallen creatures who will need to make daily shifts and corrections to our course that can only be made if we see ourselves as well as God ever more from God's perspective. The words of past saints may guide us, those things that they saw that still hold fresh and true today because they are speaking of things they knew that are eternal and timeless truths. Yet, ultimately, to keep that house in full repair and to safely explore those higher and more inward rooms of prayer without being led astray, we must make the house itself sound. I read many years ago about a school for race car drivers where the drivers were often surprised to be told that to learn to drive fast well, they must first slow way down and study more carefully the detail of their driving. Sometimes the spiritual life is like that. Rather than racing to the top floors of the building, we have to build solid middle floors on the way up. A high-rise building can be an unsafe structure if, in haste, someone pressures a steel contractor to finish the framing of the upper floors before the welding of the middle floors has been completed. So we, too, cannot rush to find the graces of contemplative prayer and mastery of advanced theology without slowing way down and learning, re-learning, and carefully mastering the detailed simplicity of the basics. The interior castle of St. Teresa of Avila is often contrasted with some other saints' concept of a ladder, and here is where that principle holds true. We never stop learning and re-learning the basics. The lower floors must be kept in good repair or the upper floors will not remain safe. Here too, is the value of the saint's advice that we must become Martha before we can be Mary. We cannot rush to the goal of contemplation without first living that servant's life of Martha. All that holds contemplation within the Christian tradition is that it is built on the simplicity of the Blessed Virgin's "Be it unto me according to Thy word." God's will is the goal, and not the graces that may or may not flow from seeking to ever know Him more clearly, love Him more dearly, and follow Him more nearly day by day. A two story building may be as pleasant and beautiful as a fifty story building, and the way we view our lives cannot depend upon whether we have reached, or will ever reach, the upper floors. Rather, it must only and always depend upon whether the structure is being built according to the Master's plan. 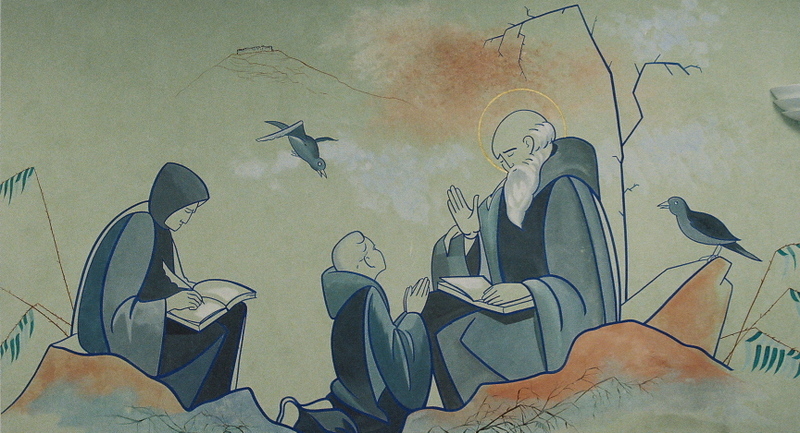 Pictures: The Abbot/Saint Benedict teaching and reading (at least, I think it's St. Benedict : murals at Prince of Peace Abbey, Oceanside, California. I spent the week-end on a private retreat at the Benedictine abbey near here, Prince of Peace Abbey. I brought back photos, of course. Here are two of them. It was refreshing time spent away from the stresses of life, going over to the abbey church for the daily offices, having quiet time to read and pray. The last time two times I scheduled time away for prayer and reflection, I thought and wrote and dealt with decisions I was making. This time, I just really needed a break from my daily routine. There was no big decision to make, no life issues to ponder. Nonetheless, I had some thoughts about the value of living a simpler and more ordered life. I didn't write anything except some notes on the life of St. Edith Stein, whose feast day is this Wednesday. Her life before she entered the Cologne Carmel prompted reflection about whether I could organize my own life more simply, keeping to a more disciplined schedule of work and prayer more like the way she lived before she entered the Cologne Carmel. It is doubtful that any drastic change will be possible in practice, however simple it may seem to plan. To start with tomorrow, for example, I have to take my SUV in for repair (so much for scheduling my morning), and then have dinner plans with friends in the evening (so much for scheduling my evening). Allowing for the first day of a new schedule being an exception, I'll have to see how it goes for the rest of the week. It is usually my experience that as soon as I plan something, someone else plans something different, and the attempt to structure time can result in more stress than structure if I do not build a lot of flexibility into the system. I have to remind myself to plan for the unexpected needs of others. 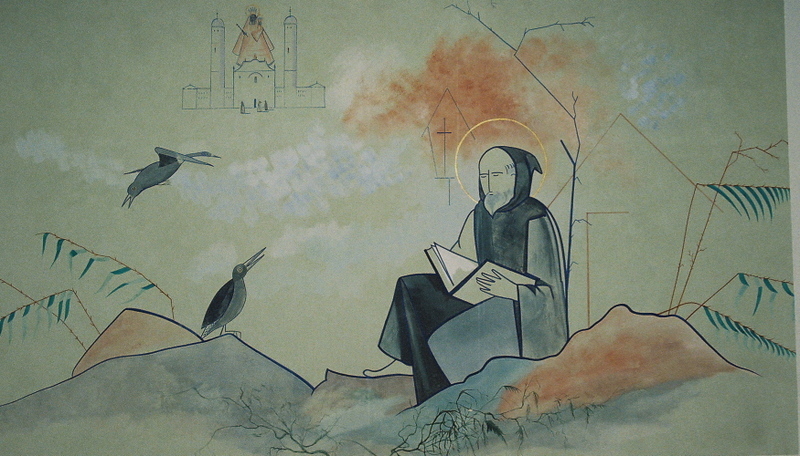 The orderly schedule of the Benedictines is a welcome escape from the regular inability to apply such a schedule to my own life. I do not have the luxury of living by the clock as a rule, as I did this past week-end. The modified goal, then, is to live by a more ordered schedule on those days when the exceptions do not arise. Only time will tell how much of what I thought about can really be incorporated into my daily life, and how much will have to remain something I can only do on an occasional week-end retreat. However, whether or not this particular retreat has much practical impact on my day to day life in the future, it was a time of prayer and liturgy and peace that I needed very much right now. Don't get too excited by the catchy title. 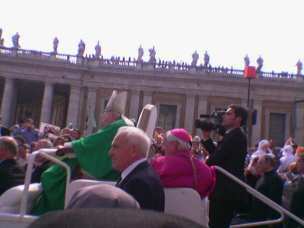 I just found my lost photo of Pope John Paul II from the last beatification he performed on October 3, 2004. I thought I had lost it the next day, but it was saved as a "draft" in my text messaging feature, and I found it today, much to my delight! I was sitting near the center aisle and near the front of St. Peter's Square, but I did not know that the Pope would actually be coming down that aisle at the beginning and end of the beatification mass. When he did, on the back of a jeep-like vehicle, I tried to figure out how the photo feature on my new picture phone worked. I did not figure it out in time to take a picture as he processed in, but I caught this one as they processed out after the beatification. At the time, I thought it was a little bit silly to be taking a picture. After all, I could buy pictures of the pope here in California, and indeed buy better ones than I could take with a camera phone. I imagined what he would think if he had noticed this woman fiddling with her camera phone, with it turned the wrong way, and I imagined that he was thinking, "Why don't you just look at me?" After all, I couldn't get that in California. Later, I felt silly about having looked at him through the lens of a camera phone, when I could have been looking at him right in front of me, a few feet away. But I especially felt that way about it when, the next day, I was cleaning up some photos on my phone that I did not want, and I accidentally deleted the picture I had taken of John Paul II! I looked and hoped, but it was gone, and I had missed part of my one chance to see John Paul II up close by taking a picture that I had deleted. However, today I found it. Before I deleted it, I had tried to e-mail it to someone, but I did not have the right feature on my phone at that time to send the pictures I took by e-mail. The phone had saved the picture as a draft in the text messaging feature, but I never knew it was there. Last week, I signed up for a new feature on my cell phone that lets me text the photos to the cell phone service provider, and they load them on a special web page for me. Today, at the Four Seasons Resort near here, I thought the decorations were pretty, and I took two pictures on my cell phone. I could not remember the text number to send them to the internet, so I saved the two pictures as drafts. Then, when I went to the text messaging feature and found the text number, I went to the drafts to send them. There were three drafts there, not just two, and I did not know what the third draft was. To my delight, it was my lost photo of John Paul II! So here is the photo, my Papal Advent surprise! I'll load that and 3 other pictures from the beatification in a photo album here, along with some pictures from Thanksgiving week-end.